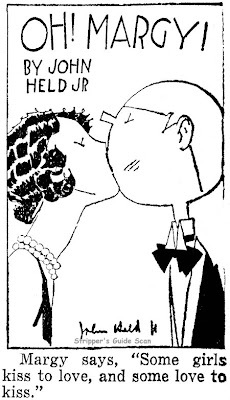 On January 20 Herriman contributes a pair of sports cartoons. The first has John McGraw, fiery skipper of the New York Giants, vacationing in LA and holding court with doting fans. Second is a caricature of racer Barney Oldfield, who was contemplating racing his "Green Dragon" Peerless race car at a local event. 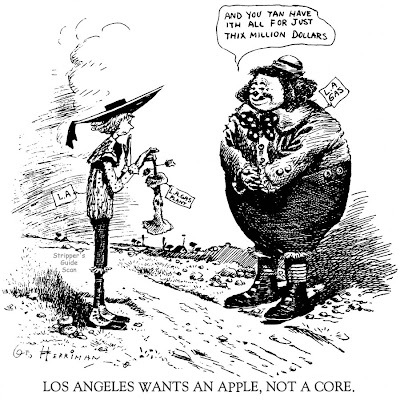 On the 21st we switch to politics, and Herriman once again comments on the offer LA Gas is making to sell the city its dilapidated plant. On the 22nd Herriman is harnessed to contribute a cartoon for a well-disguised ad. The Examiner was touting their exchange ads (exchange = barter) in this new feature, but this was the only one I ever saw. If it continued it was without the cartoons. Presented for your enjoyment, and entirely without permission, a cartoon from Cole Johnson's latest snail mail missive to me. My better half thought the cartoon was hilarious -- perhaps too hilarious. I was talking to Jeffrey Lindenblatt the other night and the subject of Gordon Campbell and his amazing collection of early tearsheets and original art came up. I still don't know what happened to his museum-quality collection after his death. It seems to have disappeared from the face of the earth. Does anyone have any idea what happened to it? D.D. Degg found information about the Bud Fisher vs. Star Company (Hearst) lawsuit on the web and it's interesting stuff. You can read it here. I find such court documents fascinating for the inside look it gives us to the business of newspaper cartooning. If anyone knows of other available court documents (like the lawsuits for the Katzies, Outcault, Mr. Peewee etc.) I'd love to hear from you. Hello Allan---Well! This is an entirely unexpected honor! I'm glad you enjoyed my enscribbulation so much. Perhaps we can make a t-shirt of this universally relatable situation--maybe four will sell worldwide! Now if only I could find some way to get Mahammod into this cartoon...FROM THE TENNESEE DEPT. OF ENVIRONMENTAL PROTECTION---This is to reassure all citizens that the TDEP has safely neutralized the air pollutant and fire hazard clean-up area known as the Gordon Campbell collection, aka Love them comics Canal. All 3200 million pounds of these carbon-based devil delts of dusty death have been reduced to a safe mountain of burnt brownie crumbs and will be graciously given to the poor in Africa in an experimental UN food project, never to cause humor and fun again. The people of Nashville are safe again. YOU'RE WELCOME!! !-----Cole Johnson. Ooh, not even in jest, Cole, not even in jest. Even the thought of such destruction makes me go have a lie-down until the room stops spinning. Edgar Bergen took the American entertainment world by storm as no other ventriloquist has before or since. And yet, bizarrely enough, Bergen wasn't a particularly accomplished ventriloquist (he learned by reading a pamphlet) and his greatest success came on radio, a rather nonsensical venue for a ventriloquist. What Bergen did have were a pair of memorable characters, Charlie McCarthy and Mortimer Snerd, superb comic timing, and the good sense to never try to upstage his dummies -- Bergen's on stage character was a retiring straight man, never the joker. Edgar Bergen's creations were heavily merchandised to a welcoming public. That merchandising extended to a McNaught Syndicate comic strip that debuted with much hoopla on July 10 1939 (daily) and July 16 (Sunday). The strip was initially drawn by Ben Batsford who did a superb job of translating the Bergen clan to the funnies. The strips were funny and in character. I'm betting that many of the gags were translated from the hit radio show. 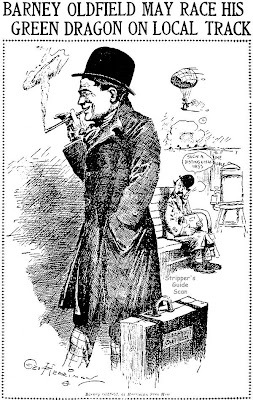 For reasons unknown Batsford left the strip after just a few months -- his last daily was September 30, last Sunday October 22. Was he having deadline trouble? Personal problems? 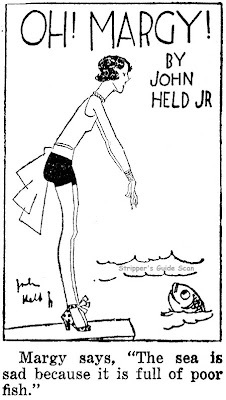 Whatever the problem was, this would be Batsford's last syndicated strip after a twenty year career on the funnies page. I hear he went into comic books in the 40s. Taking over for Batsford was Carl Buettner. He only signed the Sunday pages, not the dailies, but the art styles look to be the same to me. One website claims that he collaborated with Chase Craig on the strip, though, so maybe Craig did the unsigned dailies. After his short stint on this comic strip Buettner would go on to a career at Disney. Buettner did almost as good a job on the strip as Batsford yet for some reason the client list was dwindling by the week. I can't imagine why. The feature is already so scarce by 1940 that I can't furnish a definite end date; the latest Sunday I can find is May 12, the last daily May 25. The daily is in the middle of a storyline. Can anyone supply an end date? The dailies above are the first three days of the strip plus three from a wonderful sequence at the New York World's Fair. Hello, Allan---Edgar Bergen's ventriliquial talents were not what made him famous (his lips never stop moving). Bergen's real appeal was the Charlie McCarthy concept--here was this mild, nerdy, dull guy, who somehow had his own surpressed libido tangibly manifested for all to see--permanently better dressed than everyone, implying aristocracy with a monocle, shamelessly drooling over pretty girls, and insulting whoever he felt like, and always getting away with it! Who wouldn't want our own Charlie to cause mischief, and impolitely say what needed to be expressed, and yourself never being held to blame?----Cole Snerd Johnson. I'd love to see some of Craigs dailies and Buettners sundays too. Hello Allan----Howabout the only other strip about throwing your voice (that I can think of, anyway), Frank Crane's VENTRILOQUIL VAG, done for the Haskell syndicate in 1906. Crane's crude cartoons were so stiff as to remind one of Assyrian friezes.---Cole Johnson. My university library (CSU Northridge) houses an archive called the Chase Craig Collection, donated by the Craig family, which does indeed include material relevant to the Buettner/Craig collaboration on "Mortimer and Charlie." During a recent exhibit on comics, I recall seeing an example or two of the strip as well as a typed contract or letter of agreement re: the strip. It's a wonderful collection, incidentally, shedding much light on Craig's freelance cartooning career as well as his many years working as an editor at Western/Gold Key. Lots of file copies of old comics included. Perhaps more importantly, some correspondence from Barks. Ben Batsford did indeed do a comic book story published in 1942. I found that story decades back, dunno if there are any others or not. Yesterday we covered John Held, Jr.'s Oh Margy, so let's follow that up with his better known follow-up, Merely Margy. Merely Margy is admittedly not nearly as obscure as Held's prior effort, but its appearances were limited mostly to Hearst papers, and even a number of them didn't run it -- despite Held's name value it seems to have been considered one of Hearst's B strips. 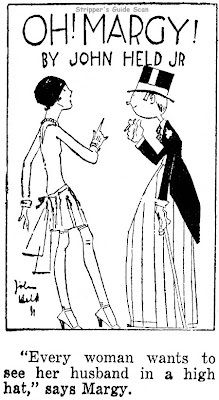 It was further hobbled by Held's flappers, considered rather risque for newspapers. Merely Margy rarely ran on the daily comics page, considered the domain of kid-friendly strips. Held's efforts were usually printed on women's pages or other more adult-oriented sections of the paper. 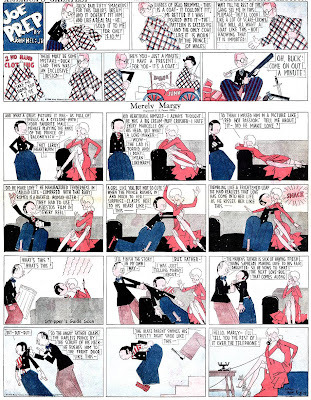 Merely Margy started in May 1927, hard on the heels of the demise of the Oh Margy panel, as a daily-only strip. The feature was pretty lavish on space; although it was a standard 6 columns wide it was very tall, probably half again as tall as a standard strip. The extra space was devoted to a typeset story below the artwork. The text stories were penned by Lloyd Mayer who was seldom credited on the strip. The full title of the daily, befitting its jumbo size, was Merely Margy, An Awfully Sweet Girl. After two years of lackluster sales, Hearst decided to move Margy over to the Sunday comics. The daily was cancelled in late 1929 and a Sunday page was introduced on October 6. The Sunday added a topper titled Joe Prep and dropped the under-panel storytelling. Not to be squelched, Lloyd Mayer continued his wordy ways and the strips was filled to overflowing with overstuffed balloons. Held, now faced with a strip that was to be featured in the even more kid-centric Sunday funnies, didn't alter his approach. Margy's matchstick gams were still all akimbo, giving peek-a-boo glimpses of anatomical parts normally discreetly covered outside the debased pages of the New York Evening Graphic. 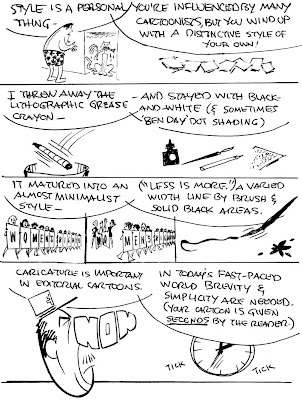 Most editors, faced with a strip that was bound to provoke snitty letters, simply didn't run the strip. Others put the strip on the back page of their magazine sections, a bastion of more adult-themed material. Others, apparently bold or clueless, ran the strip right next to Just Kids and Barney Google in the Sunday comics section. 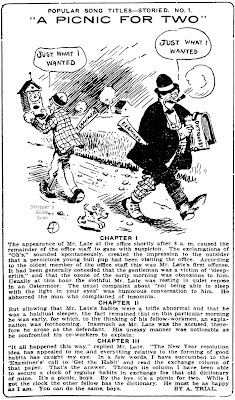 Held's appearances in the Sunday comics lasted less than a year, ending on September 21 1930. The comics just weren't ready for his adult humor (they still aren't today). Margy would make a few more appearances on Sunday magazine covers in the early 30s, but we'll talk about those some other time. Eighty-some years later it might appear as if Oh Margy is yet another attempt to duplicate the success of Ethel Hays' Flapper Fanny. 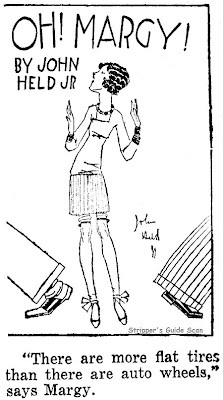 But John Held Jr., famed graphic chronicler of the roaring twenties, actually started his feature a year before Flapper Fanny. Despite the marquee name, though, Oh Margy ran in few papers and made little impression. Perhaps it was because it was syndicated by the then tiny United Feature Syndicate. UFS was only notable in the mid-20s for its bargain basement production work, sending out badly cast stereotypes of minor features to small papers that couldn't afford better suppliers. Or maybe it was because Held, already beginning to be recognized as an icon of the age, was unwilling to put a lot of effort into the tiny panels. The drawings certainly appear to be vintage Held, if not particularly imaginative, but the captions have a lot of klunkers. Perhaps Held was already farming out the writing, as he did later with Merely Margy. We do know from Shelley Armitage's biography of Held that the panel was ghosted for awhile by such supremely unlikely replacements as Doc Winner. Why Held signed up with UFS in the first place is a bit of a mystery. Certainly he could have, and eventually did, command the attention of the major syndicates, and he was in constant demand for high-paying magazine cartoons throughout this period. Oh Margy ran as both a daily and Sunday feature. The Sunday, however, was not of the color Sunday funnies variety, just a larger version of the black-and-white daily. It started on April 6 1924, followed by the daily on May 5. The daily ran in few papers, but the Sunday version is downright rare. The feature ended on May 22 1927, the daily ending one day earlier. These dates are all based on the San Francisco Chronicle's run, one of the few major papers that ran and stuck with the feature over its three year term. Five gifted artists this week received one of the finest Christmas presents of their careers. They were named winners in United Feature Syndicate's $10,000 Talent Comics Contest. Thomas Okamoto, 39-year-old freelance advertising designer of El Monte, Calif., won first prize of $5,000 with his "Little Brave," a daily pantomime gag strip about a young Indian boy. Second-place honors and $2,500 went to Bill O'Malley, 52, ex-newspaper artist now free-lancing out of Carmel, Calif., for "Reverend," a daily panto­mime gag strip featuring a young clergyman. Third prize ($1,500) was awarded George Booth, 29, of Cold Spring Harbor, Long Island, N.Y. Mr. Booth, former Marine who was born in Cains-ville, Mo., created "Spot" for the contest. It's a daily panel concerning a lovable mutt who acts like a member of the family. Coming in fourth and fifth, respectively, each for $500, were Bob Kuwahara of Larchmont, N.Y., and John Whitaker of Memphis, Tenn.
Mr. Kuwahara, 53-year-old freelance artist who does work for Paul Terry, submitted "Marvelous Mike," a continuity strip centering around a precocious youngster who offers merriment and wisdom to the family circle. Mr. Whitaker's "Sam's Su­permarket" is a panel focused on urbania's contribution to humanity, the supermarket. Mr. Whitaker, 27, is a sales repre­sentative for Delta Airline. All five have been signed to contracts, according to Laurence Rutman, UFS vice president and general manager, who said there were 480 entries in the contest. "We are delighted with the results," he said, "and believe we have succeeded in finding new talent. Yes, we plan to run another contest, say in the next two to three years. It would be impractical to do it annually." Mr. Rutman added that the syndicate hopes to release the five winning products, individually and not in package form, shortly after Jan. 1. "It all de­pends on when we get their ma­terial," he said. Mr. Okamoto, is a native of Kent, Wash. After one year at Sacramento Junior College, he attended Chouinard Art Insti­tute in Los Angeles, following with a job as staff artist in the Walt Disney studio. He then taught art in Colo­rado. In 1943, he served in the Army as a master sergeant in military intelligence, and when he was discharged in 1947, he went to Art Center School in Los Angeles until 1951. After a stint as an advertising agen­cy art director, Mr. Okamoto became a freelance advertising designer. He is married and has two sons, Deems and Eric. 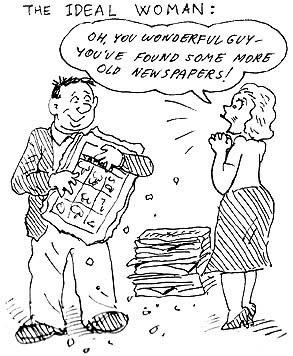 Mr. O'Malley at one time worked on the San Francisco Call-Bulletin and the Oakland (Calif.) Tribune as a cartoon­ist. He has four books to his credit. Mr. Booth in 1953 served as a vacation substitute for C. D. Batchelor of the New York Daily News, and while he was a Marine he was cartoon editor of Leatherneck. He got his schooling at the Chicago Acade­my of Fine Arts. "The market is glutted with adventure strips. We want to find new approaches and ideas, with emphasis mostly on humor. Apart from getting upcoming talent, we hope to have an an­swer soon to those who have been criticizing the pulling power of the comics." It's impossible at this time, of course, to predict the quintet's pulling power, but at least Mr. Rutman has achieved half the goal: the three strips and the two panels emphasize humor. "We're happy they do," Mr. Rutman said. "That's what the business needs." "Reverend" may have won the strip longetivity award, but I think the outstanding career longetivity award winner is definitely George Booth. Hard to believe he was ever 29! Thanks for the old E&P article, it's a great find. Jim is right on the money -- most folks glance at an editorial cartoon and if they don't get it instantly, they move on.